The collapse of the supersport 600 class might lead you to believe that nobody wants this capacity of motorcycle anymore. Yet the truth couldn’t be any further away if you emigrated to Mars. 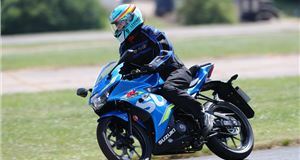 While riders and manufacturers have moved on from the condensed intensity of these supersport machines, they have shifted focus to the middleweight sector. 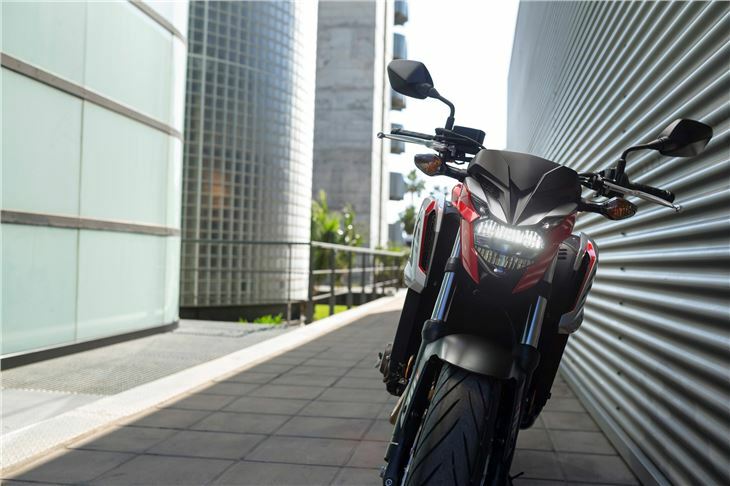 And this is where the Honda CB650F comes into its own. 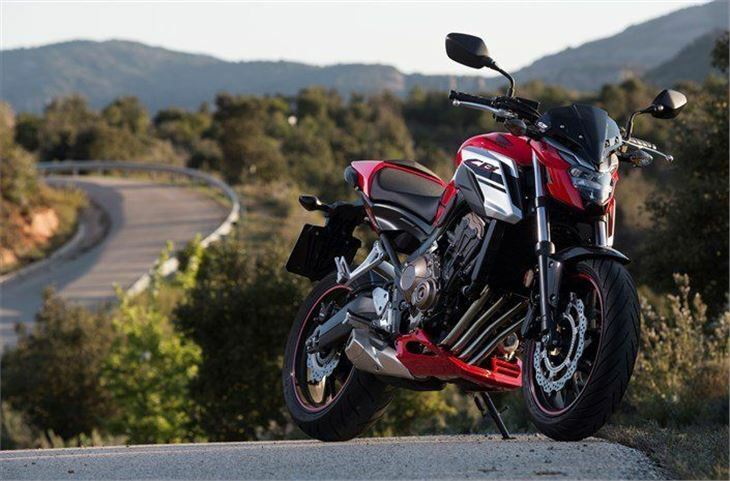 The original 2014 CB650F was a good bike. A very good bike, in fact, but there was always something of the beige vanilla about it. 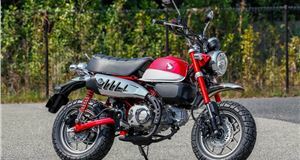 Objectively excellent in all respects, it just didn’t quite ignite our two-wheeled passion, but this updated model addresses that and then some. 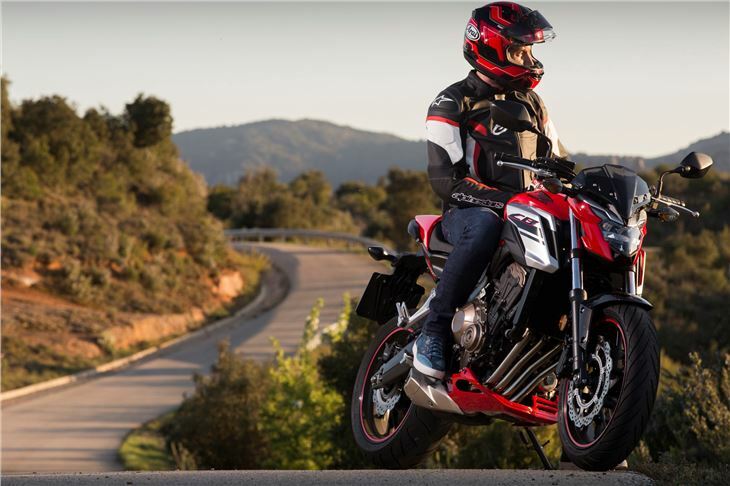 Changes for the latest CB650F are small, but they make significant differences to the way the Honda rides, performs and, perhaps most importantly, feels. 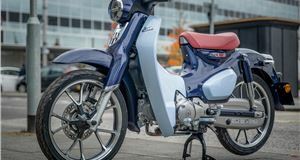 The motor remains the same capacity and design, yet now has 4PS more to reach 90PS and meets the latest emissions regulations, so you can have your cake and chomp it. Making even more of this are revised gear ratios between second and fifth, so this cluster of four cogs is now shorter. 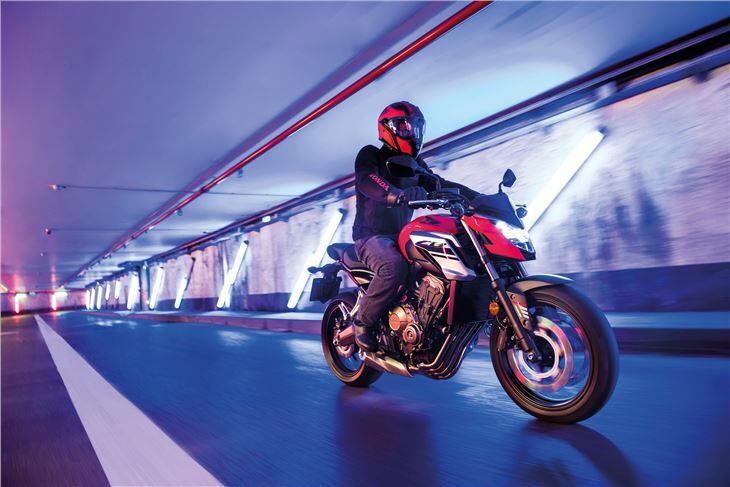 The result is the engine fires through the middle section of the six-speed ’box with more zing while still offering a filter-friendly first and cruiser sixth. As well as the shorter ratios allowing the motor to whizz round the rev counter more urgently, the engine feels more alive with its added power. There’s real punch to the delivery, but it’s always smooth with no obvious step or tail-off. 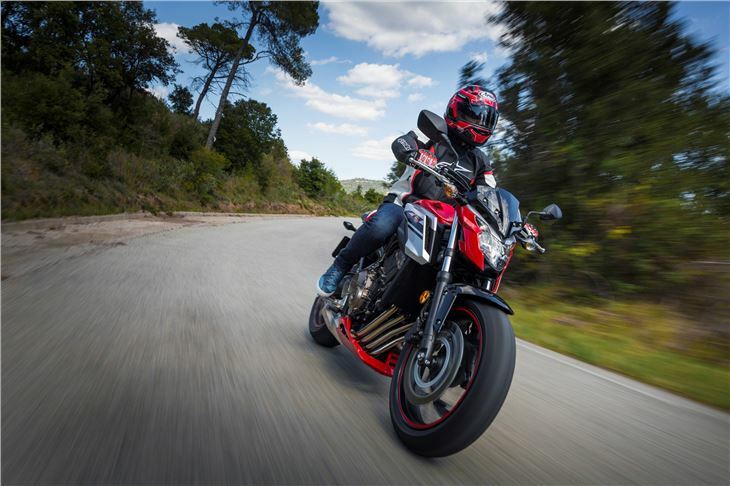 Instead, you just twist the throttle and revel in how the four-cylinder lump spins in a way that harks back to the old Hornet model beloved of many Honda fans. That comparison with the Honda, which set the bar for the middleweight sector almost 20 years ago, rings true in other ways. 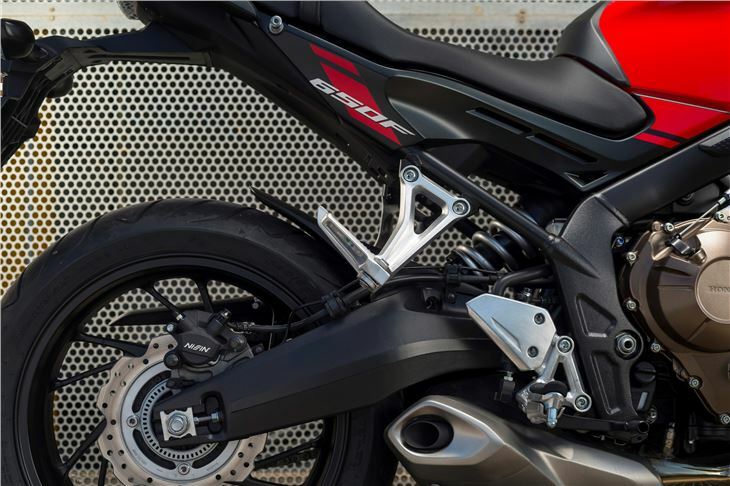 The CB650F’s riding position is now canted forward more than before, helped by bars that have been lowered by 30mm. 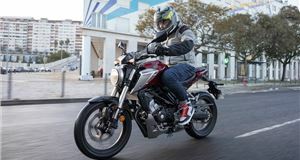 For anyone considering this bike for commuting, that could spell disaster, but the CB remains very comfortable and the seating position is completely natural in a manner Honda just always gets right. 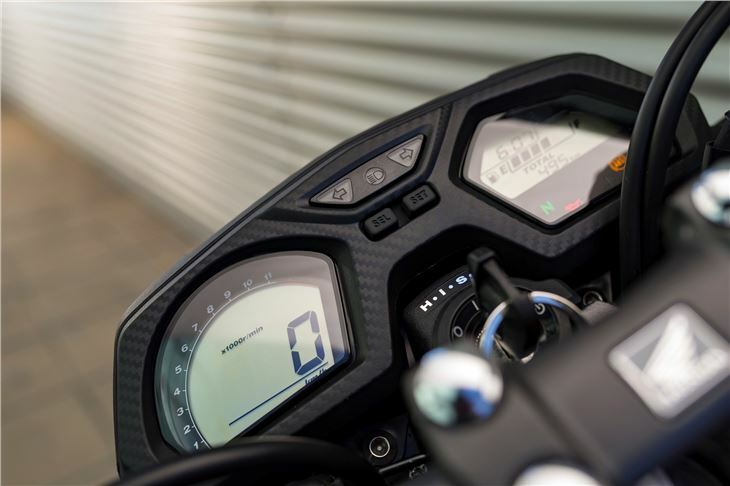 With the rider’s body tilted forward, it makes motorway riding easier as the wind is directed over the small front fairing and on to your chest to give support. At lower speeds, your wrists don’t ever ache with the extra weight they have to support. The seat is well padded and the saddle height of 810mm is low enough for most, while all of the controls have a positive, light action. The only downside we’d note is the simple instrument display is conspicuously lacking a gear selector indicator. When you have an engine that loves to rev and closely packed middle gears, it does make this an essential bit of kit, so it’s a small giveaway to where Honda has saved a bit of money in the CB, which is built in Thailand rather than Japan to further keep the cost down. 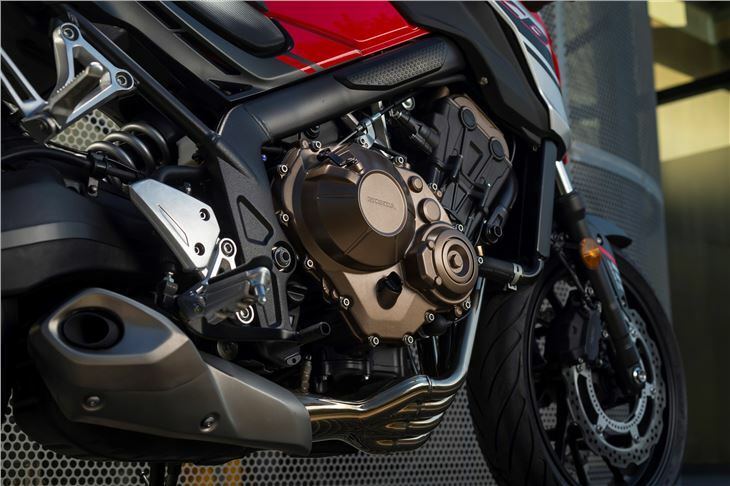 There’s no concern over build quality, though, and the CB650F reeks of Honda’s usual attention to detail. Granted, you don’t get much in the way of standard kit other than ABS brakes. 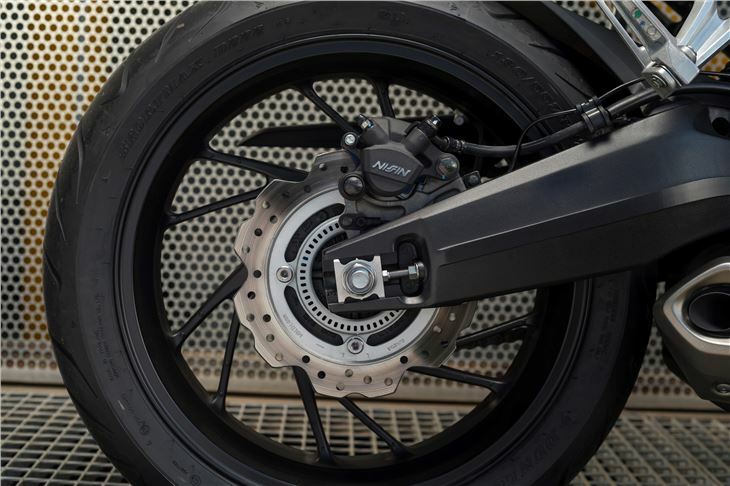 The rear shock absorber is adjustable, but that’s your lot for tweaking the set-up. 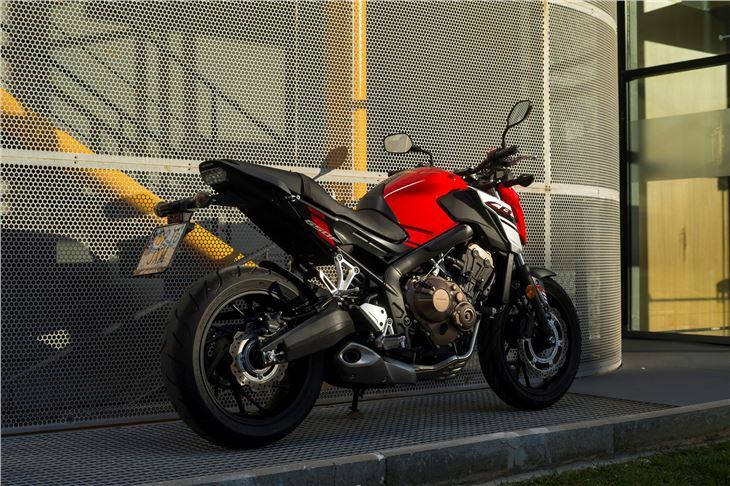 Once on the road, you won’t worry about that as the CB offers up plenty of grip and traction. You can push into bends with confidence and the steering is among the quickest we’ve enjoyed on any middleweight ever. It frees up thinking time for what’s further up the road, while the twin disc front brakes and single rear will bring you to a fuss-free stop should the conditions dictate it. Around town, the suspension is more than up to fending off the worst craters and pockmarks. 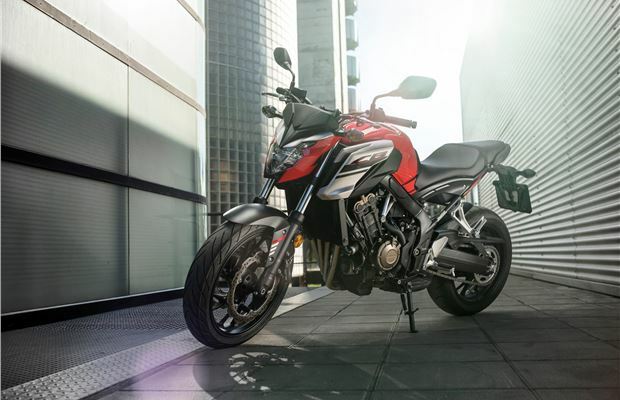 There’s a plushness to the Honda that puts it right up there alongside the best in this sector such as the Yamaha MT-07. This is helped by the new Showa-supplied Dual Bending Valve system that is claimed to offer a smoother damping set-up. It certainly seemed to work well during our time on the CB offering good comfort with any untoward dive under heavy braking. All of this adds up to a middleweight that calls into question the need to seek out anything with a larger capacity engine. 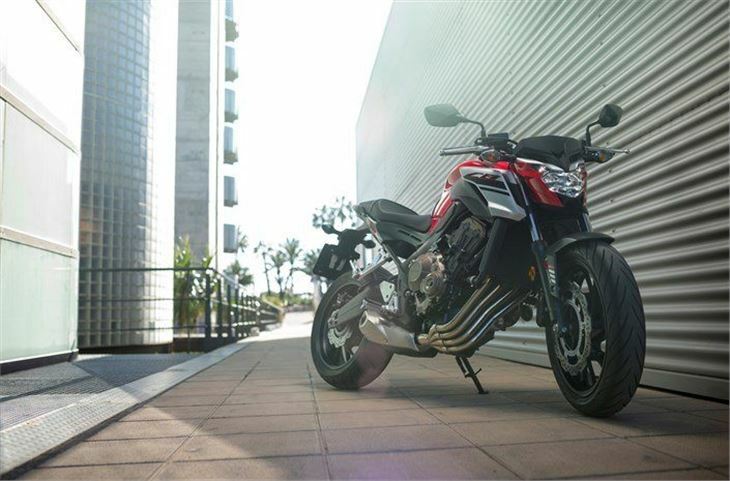 Like the Hornet before it, the CB650F is massively entertaining. It's capable of anything you ask of it and offers superb value. It’s a bike everyone should want. Performance: Top speed 130mph. Fuel consumption 59.3mpg (claimed). VED £88.